Although Raghu Iyer pipped Philip Allison to win our heat of the 2016 Charity One Ball Competition, it was third places Joanna Iyer who won more games of the trio at the National Final at Surbiton today. 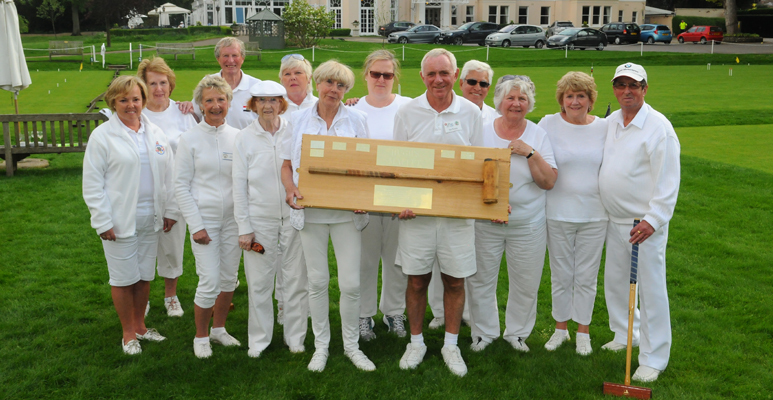 The big winner was this year's chosen 'croquet charity' Myeloma UK's - we raised £100 from the 10 players in out heat, and this was added to by a few generious donations taaking our total to £150. Nationwide there were 32 heats involving 409 players and £ 3,400 was raised, plus a likely further £ 600 in 'gift aid'. 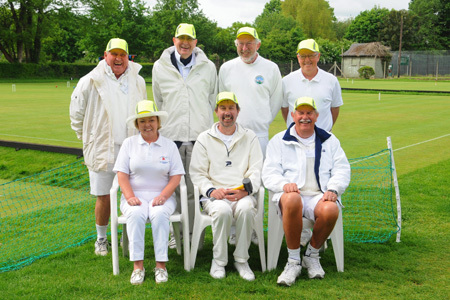 The photo is from our heat last month, featuring (from the left): Raghu Iyer, Mike Fensome, Helena Fensome, Chris Roberts, Harry Midgley, Frances Colman, Colin Morgan, Joanna Iyer, Philip Allison and Robin Morrell. 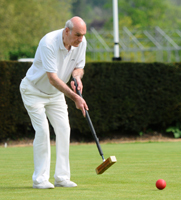 Phyllis Court 'B' came from behind to 'squeak' a narrow 7 - 5 victory in today's traditional Handicap League opener. The 'C' lead 1 - 3 after two rounds of doubles, but the 'B' took six of the eight singels rubbers to clinch the win. PCC 'B' - Raymond Wood (c), Mary Gaynor, Hugh Crook, Colin Morgan. PCC 'C' - Raghu Iyer (c), Delia Norris, Dianne Brown, Don Rutherford. Ian Norris and Diana Zatouroff lead nearly all the way in this 'High/Low' Doubles Tournament and despite a hiccup and the last two games going to the 13th hoop, they emerged victorious. The manager was delighted that they pulled clear with one more win then their closest rivals, as this gave the event clear winners, rather than the prospect of a multi-pair tie on wins, necessitating much 'working-out'. The fly in the eventual winner's ointment was the Mike Fensome and Margaret Broughton duo, who beat Norris and Zatouroff in the penultimate round, and they were in the 'box seat' but there loss to Mary Gaynor and John Maguire at the 13th hoop, also lost them the tournament win. Congratulations to the winners, Zatouroff especially as it was her first, and also a warm welcome to new member Robin Coates who enjoyed his first competitive event. that start on Sunday at Surbiton CC. England are in with a good chance, as are New Zealand, but the hot favorites are the spectaculaly hard hitting Egyptians. Don't miss this change to see the action - Surbiton CC, Alexandra Dive, Surbiton, KT5 9AA (parking on site, and surrounding streets). The Club's renown hot lunches will be available and there is a licensed bar! Frances Colman & Chris Roberts have been appointed referees for the touranment and will be there every day except Tuesday & Wednesday. There will be daily updates from the Chamionship posted here. The playing schedules for our 2016 Season-Long Competitions are now on display on this website. Go to the front page and click on the buttons in panel on the left hand side. 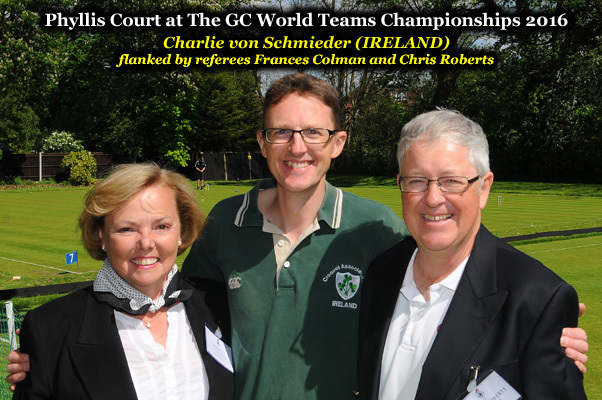 Phyllis Court had a good presence at the WTC today with tournament referees Frances Colman and Chris Roberts able to wish Charlie von Schmieder good luck before play. They lost all six rubbers in the test match on, what was, weather-wise at least, a glorious day at Surbiton CC (details of the tournament are below). Charlie paired-up with Patsy Fitzgerrald in the doubles but found Mohameds Karem and Nsar too strong, and Charlie got no joy either in his singles match with former World Champion Nasr. Ireland play the USA tomorrow and Sweden on Tuesday. Meanwhile, England had some closer games on route to defeating Wales 5-1, and they play South Africa tomorrow and second seeds New Zealand on Tuesday. Charlie von Schmieder didn't play in Ireland's match today against the USA, which was drawn 3 -3. He will be playing tomorrow (Tuesday) in Ireland's match v Sweden however, and it is known that a few Phyllis Court members are planning a visit to Surbiton to cheer him on. England won their test match today 5 -1 against South Africa, and play the second favourites New Zealand tomorrow. Holders Egypt have not dropped a single rubber yet and looking 'hot stuff' indeed; thay play the USA. Nice snippet - Phyllis Court member Jim Walter made some 4mm measuring sticks (for fine checking ball distances) for tournament referees Frances Colman and Chris Roberts,. Jim will be pleased to know that Frances used hers today in a game between Ireland and the USA - so thank you very much again Jim! No report tomorrow, because Chris & Frances are refereeing Tier 2 of the Championships in and near Bath service will be resumed late on Wednesday evening. PCC 'A' made it two wins from two game sin the SCF Level League, when they beat Harwell 7-0 toady at home. More details will follow in a couple of days time. Charlie von Schmieder's (second from the right) Ireland beat Sweden 5 -1, and Egypt beat USA in the Day 3 test matches on Wednesday, causing a need for a play-off for second place in their group. Charlie won both his doubles and singles matches to contribute welll in the Sweden match and then, in the play-off re-match with the USA, he won again, 2-0 against the USA top player and captain Ben Rothman. At close of play in those semis today (Thursday), Ireland were 0-3 down to the Kiwis, and England 2-4 down to Egypt, but with plenty of croquet left to play in both ties. Referee's Frances Colman and Chris Roberts spent the two days officiaatin in at the Tier 2 event in the Bath area, but will be back at the top event on Thursday and Friday. Members will be sad to learn of the recent death of Bruce Mason. 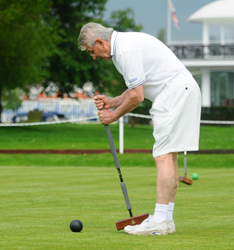 Bruce hadn't been able to play Croquet in recent months but hitherto was a good supporter of internal tournaments, particularly 'Drawn Partners'. In 2013 he won the 5+ Doubles (Cave and Wolfe Salvers) with partner Ralph Chambers and in 2015 a Drawn Partners with Pat Eades. Details of the funeral arrangements will follow when they become known. Ireland 'hit the buffers' at the WTC today when they were beating 1-10 by on-song second favourtites New Zealand. The semi-final teast match actually started yesterday and Charlie von Schmider (playing at no.2 this time) was well beatned by the Kiwis no.1 Duncan Dixon. Charlie and partner Janck Clingan took the first game of heir doubles but then lost the next two, and then Charlie enjoyed wto close games in defeat to Jeny Clarke, the former Women's World Champion. Meanwhile, England came unsuck in the orther semi against holders Egypt 2-10, so it will be the Egyptians v New Zealand in the main final on Friday and Saturday and England will ply Ireland for third place. Charlie von Schmieder was back I action today playing at no.2 for Ireland who took on England in the 3rd/4th place match, but it was 'more of the same' results wise at least. England won all six of today's rubbers to seal 3rd place, including Charlie's doubles match and his afternoon singles where he pushed Lionel Tibble all the way. Meanwhile, the Championship final got underway and New Zealand hold an unexpected 4-2 lead over holders Egypt. Referees Frances Colman and Chris Roberts bowed out this evening (as they have croquet of their own to play tomorrow), but not Frances took charge of the top game of the day between two former World Champions Chris Clarke (NZ) and Ahmed Nasr (Egypt), which was a nice way to finish. New Zealand won the WTC today, defeating holders Egypt in the closest of matches befitting this World Final. Jenny Clarke's victory over Mohamed Nasr got the Kiwis over the line for victory by 7 rubbers to 5 - and huge congratulations to the folk from the Land of the Long White Cloud. Charlie von Schmieder's Ireland finished fourth behind England, and 'our man' ended his tournament with a flourish by beating the former Women's World Champion Rachel Rowe. The USA beat Sweden for 5th & 6th places respectively and South Africa won at the last hoop of their last game in the crunch tie with Wales, to finish 7th and 8th, relegating the Principality's team to Tier 2 for the next Championship in four years time. Our 'Local Friendly' team scoreda good result toady beating visitors Blewbury by 10.5 to 5.5. PCC team: Pat Eades (Captain), Pam Mead, Alex & Dilys Earnshaw, Pauline Wood, John Maguire, Margaret Broughton & Michael Christmas. 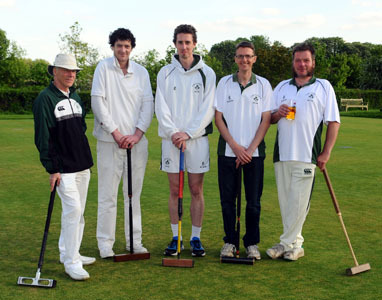 PCC 'AC Handicap' played Oxford University today in their first league match. The students got the better of our side winning all three games, with the fourth rubber to be played a a later date. 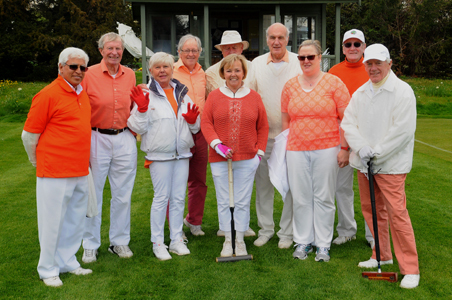 The All England Club visited Phyllis Court today for our annual duel-code friendly. In the AC, Chris Roberts beat Mike Hann (advanced) and Raghu Iyer beat Jonathan Smith (handicap), but Wimbledon got their own back with a very close win in the (handicap) doubles in the afternoon. In the GC (all level play doubles), Phyllis Court held a3-1 lead at the halway stage, but lots their way ater lunch and didn't win another game, os lost 3-5. A sign-up poster is now on display in the pavilion for those interested in playing friendly doubles games with our American visitors on the mornings of 21 & 22 June. Phyllis Court reciprocal club, The Hillsbro Club from Florida, will be here to play some games where they will partner host players. This is a good oportunity to show them a warm reception, so please do put your name down for one or both morning's play. Also on display are sign-up posters for the 3+ Singles (Red Ball Trophy) on 6 June and the 10+ Doubles (Cave & Wolfe Salvers) [where the combined handicap of a partnership must be 10 or more] on 13 June. Phyllis Court will be doubly represented at the four-day European GC Championships at Budleigh Salterton this week (Thursday 26 to Sunday 29 May). Helena Fensome will be representing Finland again and Chris Roberts has won a World Ranking Place for this annual tournament that attracts entrants from across the continent. World AC Champion and England GC captain Stephen Mulliner starts as favourite, with Spain's Jose Riva seeded second - Roberts is sixth seed. All the results will be put-on-line at www.croquetscores.com 'as they happen', so you can follow the fortunes of the PCC pair (noting that Helena plays under her former name 'Jansson'). If I can get on-line whilst away, I will endeavor to post a report each day for you. It was a glorious first day today here at Budleigh Salterton in Devon, with beaming sunshine and from a cloudless sky. Three 'best of 3' matches was the order of the day with players seeded into our blocks of eight. Helena Fensome had a tough one to start, playing the AC World Champion Stephen Mulliner. She was second best in that one, and likewise against a Spaniard but recorded a win against a Czech player. It was more of the same weather wise and results wise for the Phyllis Court duo today. Chris Roberts won twice more today to qualify for the knock-out stage with two games to play. He did lose one today though, against the top seed in his block. Helena Fensome was again one win from her three matches today, and with others in her block already having recorded four or more wins, she now can't qualify, so will contest the consolation plate event for the last two days. Phyllis Court had a good day at Budleigh Salterton today, topped by Chris Roberts winning all three of his matches today to reach the semi-finals of the main event. On route he beat former England international James Goodbun for the first time, avenging his loss in the final of the Surbiton Open a couple of months ago. 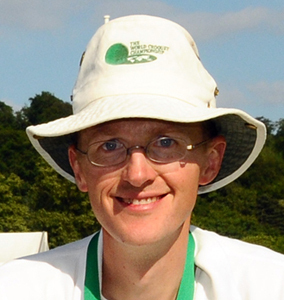 Roberts now faces AC World Champion and England GC Captain Stephen Mulliner for a place in the Championship final. Meanwhile, Helena Fensome won through to the later stage of the consolation plate event, which also concludes tomorrow. Chris Roberts lost his semi-final to Stephen Mulliner in straight games to end his European Championship hopes. Helena Fensome was beaten in the semi-finals of the plate event.